Welcome to Part 4 of our ongoing series focusing on how to become a bestselling author. Today we feature an interview with Sharlene Martin Moore. Sharlene is a creator/designer of online postcards. Her cards are used by some of the most successful authors in the biz to promote their books on various social media networking sites as well as on on their own websites and blogs. Her cards a.k.a. image memes, are an example of what creates a buzz online. When an author wants to promote his/her book they turn to Sharlene to get the right tone and look that will convey the spirit of their book. Whatever you want to call them – graphic image cards, online postcards or graphic memes – they are attention grabbing and they have the ability to create a stir among readers and fans. Whether you want to announce a special sale, or a contest you are running, or to grab attention before an upcoming release – Sharlene will get it done. She is one of the dynamic people working behind the scenes, helping authors become bestsellers! I create graphic image cards for authors to use on Facebook, Pinterest, Tumblr and Twitter. Who are some of the authors you’ve worked with and books you’ve done postcards for? Eloisa James, Linda Francis Lee, Lauren Willig, Susan Elizabeth Phillips, Beatriz Williams, Jennifer McQuiston, Katharine Ashe, Kate Noble, Sara Jane Stone, Cathy Maxwell, Terri Osburn, Emily Greenwood and Cat Devon. I just started working with Ella Quinn and Jill Shalvis which is exciting. Do you have a lot of repeat clients? Yes, I do have a lot of repeat clients which makes me very happy. Tell us about your background – how did you get started as a postcard designer? I am a former elementary school teacher with a great love for arts and crafts. I loved glitter as a child and making attractive bulletin boards for my classroom as a teacher. 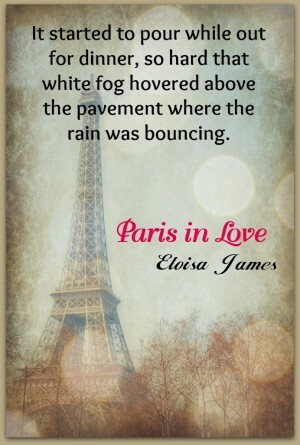 Eloisa James is responsible for my start. I shared a couple of cards I had made with her, she liked them and off I went. As she shared cards on her Facebook page, other authors asked her who was doing them and she sent them to me. I owe her so much and I am honored to work with her and her assistant Kim Castillo. What do you charge for a post card and how often can an author post it and where? Can they post it forever or is there a time limit? Can other people (i.e. fans/readers) repost it online? I charge $5 per card or you can get 6 cards for $25. The author can post the card as many times as they want on any online medium such as Facebook, Tumblr and Pinterest. Some authors share them on their blogs and use them on Twitter. There is no time limit on the cards. I love for others to repost them and I know the authors love it too. How do you put a postcard together? What kinds of quotes and images do you look for? It begins with a background, then either a quote or author blurb, possibly a review. I work to create an image that will convey artistically the message the author wants to share. Can an author provide you with the image and the quote? Definitely, some pick the quotes they want on the card and some ask me to find quotes from their book. Also some want the book cover on each card. In your experience, how popular and successful are online or social networking postcards and why? I think graphic cards or memes are very popular. I feel they are successful because a graphic image catches your attention much like billboards do. Images are the most shared and talked about posts on Facebook. Are you open to doing cards for authors who write horror, suspense, or mysteries? I am open to other genres as long as the material is not offensive to me. Why do authors keep coming back to you again and again? I have priced my product to be affordable even by new authors on a limited budget. The cards allow them to share snippets from new books, announce a new cover, and share the word about a limited time sale and so much more. They are pretty and everyone likes pretty. Social media moves so quickly, especially on Facebook, my cards allow authors to share something that will get attention. What do you love the most about creating these images? I love being able to create something that someone I admire likes. It is very rewarding to see my cards on the Facebook pages of authors I have admired and read for years. Connect with Sharlene Martin Moore via facebook, on her web site and on twitter. What a wonderful idea and a wonderful resource.